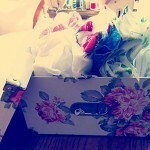 what shall I make?” I’m sure most crafters have the same dilemma, what to do with fabric scraps! My daughter asked if I’d ever tried applique and suprisingly enough I hadn’t. I’ve heard the word in sewing circles but never really given it any thought so went Googling to learn more about it. Ah, “make do and mend items” perfect for my upcycled projects! 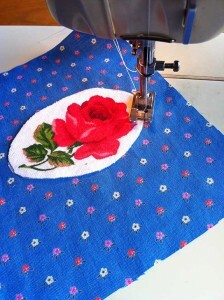 So, off I went Googling and found a ton of stuff about Applique and how to use fabric scraps. There were tutorials, videos and thousands of images! I work better following text and pictures but will occasionally use a video to help when I first start learning a new craft. Having done my research it was time to have a go. I decided to use some of my scrappiest fabric scraps for a trial, I didn’t want to waste some of the prettier pieces. I followed the instructions on one of the tutorials I’d found and got my pieces ready for pressing. I decided not to do a complicated shape for my first go and figured an oval shape shouldn’t be too challenging. After pressing the the pieces together it was time for the sewing. You can do this by hand and there are plenty of tutorials explaining how to. I used my machine as it has the decorative stitches. I chose to use a zig zag stitch quite close together. It was tricky keeping the stitching exactly in place moving round in a curve but I got better as I went along. I thought it looked not too bad for a first attempt! One thing I did learn that wasn’t in the tutorial, make sure your bobbin is full. Mine ran out halfway round the flower and you can see where I’ve rejoined. I haven’t shown the messy bit in the photo! 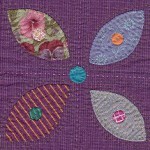 Back to the question “I have fabric scraps, what shall I make?”, I wanted to use applique for something useful. I’ve already written a tutorial on how to make baby bibs so decided to try and add applique to one. 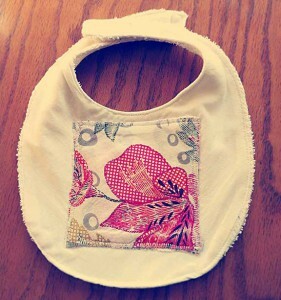 Again, I used the scrappiest fabric in my stash and quickly ran up a baby bib. 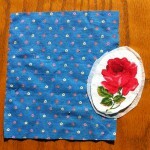 I used the flower fabric scrap in first attempt and cut a square this time. It was challenging going round the corners but I’m sure I’ll become better with practice. I’ve got all sorts of ideas now. Animals on bibs are popular and nature scenes would also work. 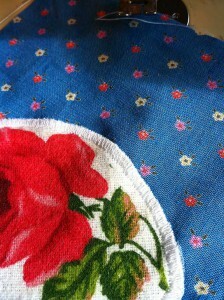 The little dresses I’ve made with plain fabric would look great with some applique. In fact, you could apply it to any project! So the next time I ask “I have fabric scraps, what shall I make” I’ll know the answer! You are amazing! You wondered what APPLIQUE was, Googled it, AND MADE THAT?! Very nice! That’s why I keep coming back! Your Blogs are amazing, you are amazing! Of course I also had to read about making baby toys too! I love your website and you probably have a lot of repeat visitors! Great job, Kathy and I will be back!